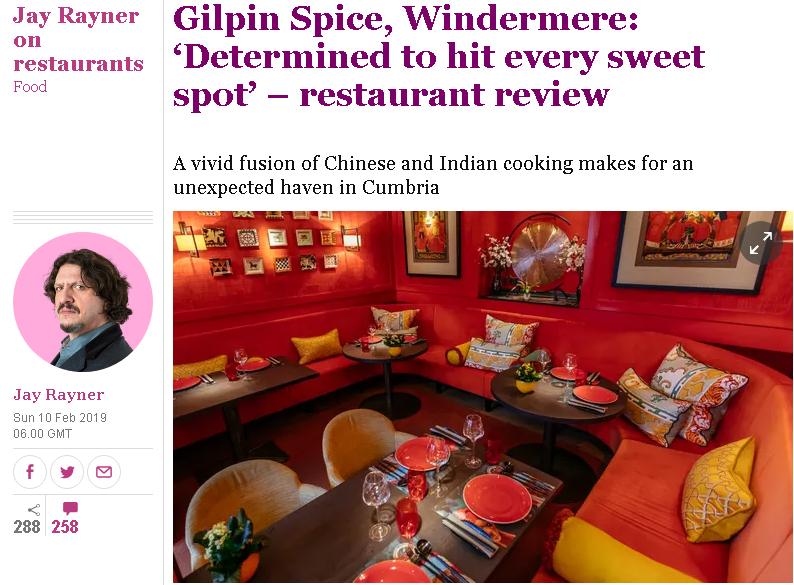 Jay Rayner for The Observer was in Windermere, visiting Gilpin Spice at Gilpin Lodge in the Lake District, described as “an act of bravery, fashioned from raw wood, vibrant dangling lampshades, tamarind, garlic, ginger, noodles and open guttering flames”. The food is best described as “Desi-Chinese food, a venerable amalgam of Chinese and Indian styles courtesy of Hakka immigration into Kolkata”. And Jay described it bite by bite in mouthwatering detail. Gilpin Spice is “a complete godsend” for locals in an area of “tweezered platefuls”. Grace Dent for The Guardian has enjoyed a few weeks of top meals, delicious puddings and perfect restaurants. 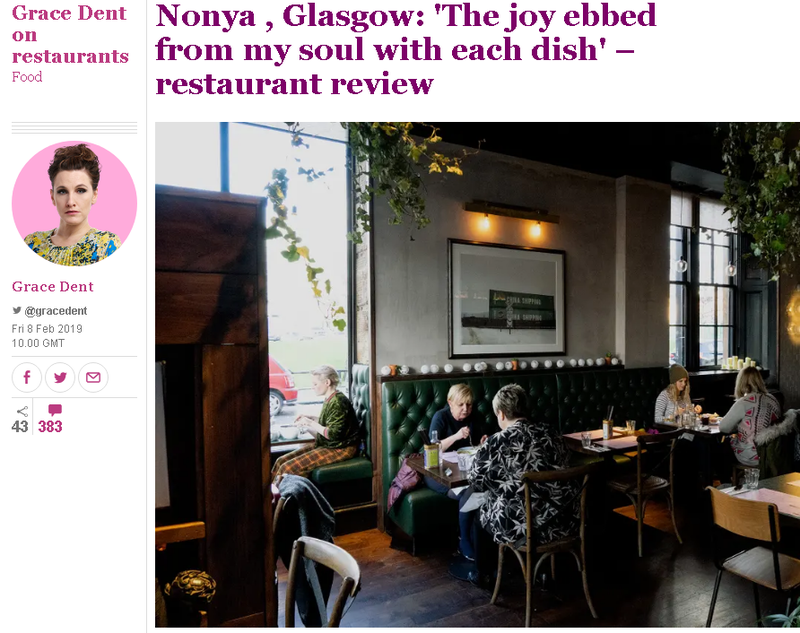 Then she went to Nonya in Glasgow, “whose reputation had lured me 400 miles from my sofa, arriving optimistic and starving, only for the joy to ebb from my soul with each new dish”. In the mould of Smoking, Goat, Kiln and Som Saa (“loud music, sparse decor and street-food-style small plates”), with Perenakan (Straits Chinese) cuisine and other southeast Asian influences, Nonya had been warmly recommended to her, but Grace had also heard tales of inconsistency. Clearly, she hit an off-day. 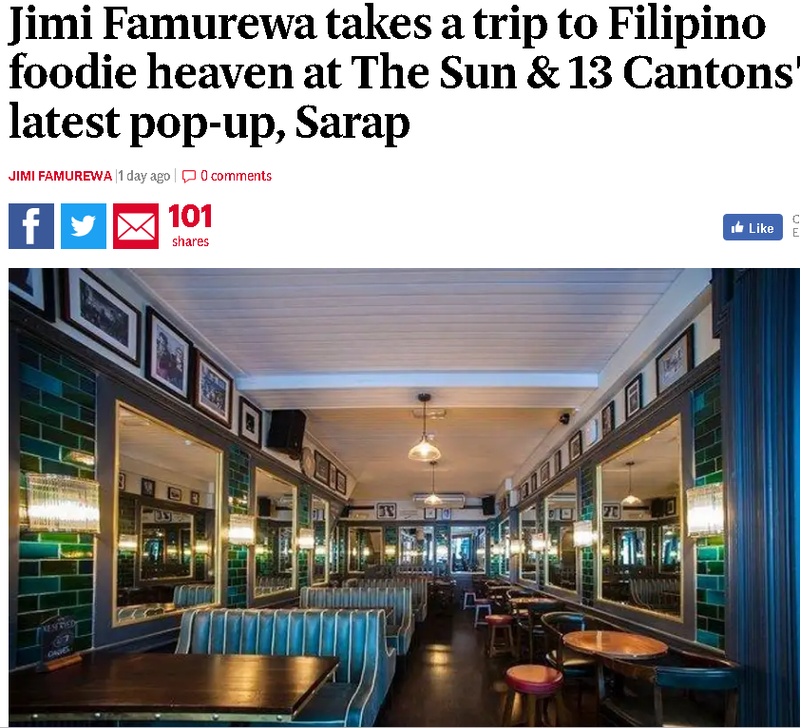 Jimi Fanuwera for The Evening Standard paid a weekday visit to an old Friday night hang-out, and realises there’s more to The Sun and 13 Cantons in Soho than “an overcrowded patch of kerb with a bar attached”. In fact, there’s a lot more: the pub’s “revolving-door kitchen has emerged in recent years as one of the more potent seedbeds for soon-to-be-massive London restaurant talent”. Darjeeling Express and Sambal Shiok, to name but two, have started out with pop-ups here, a “culinary fame academy”. Current incumbent, Sarap (which means ‘delicious in Tagalog’) is a Filipino BBQ specialist. Fried chicken wings “densely covered in vinegary banana ketchup” were “unusually addictive” and lechon (stuffed, crispy roasted pork belly) was an “unmistakable headliner”, although Sarap also handled more delicate dishes, like kinilaw (“essentially, Filipino ceviche”) well, too. Puddings were “a blast of tropical sun”. 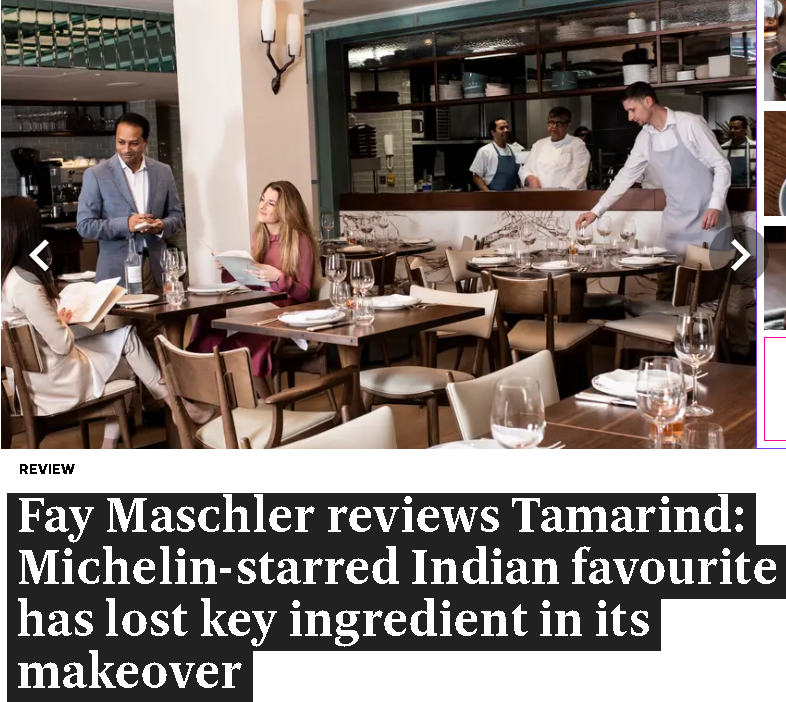 In the same week that Atul Kochhar announced his new restaurant, Fay Maschler for The Evening Standard returned to his first London venture, Tamarind. Closed for much of 2018 for refurbishment, the Mayfair Indian has opened with new chefs, new menus and a new first-floor space “with a view of Mayfair backyards”. Fay’s recent visit to newly-opened Farzi Cafe (with its owner of course) took up much of her review, but when she finally mentioned Tamarind, it was with disappointment. Her review can be epitomised with “missing layers of flavour”, “vertiginous” drinks prices, “rather morose” rabbit seekh kebab and a salad “drizzled with too much sweetness”. 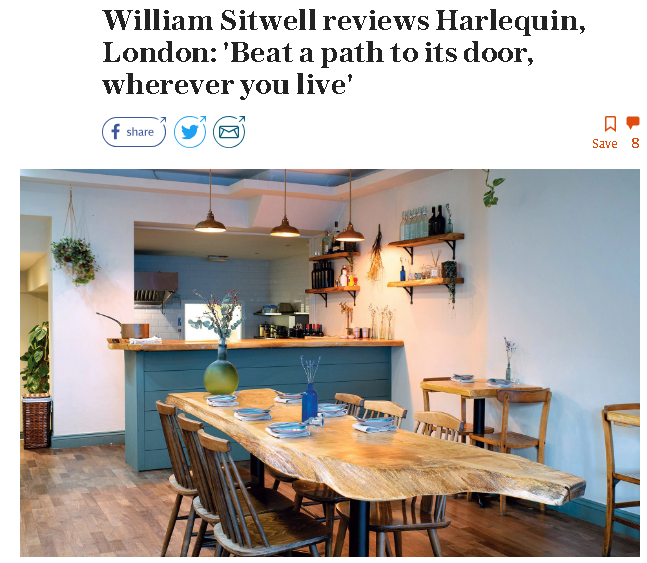 William Sitwell for The Telegraph gets in first at Fulham neighbourhood bistro Harlequin, which opened at the end of 2018. One of William’s favourite summer poolside games is ‘fantasy restaurant owner’, deciding exactly what his perfect restaurant would be like. from the cuisine to the uniforms, crockery and wine list. Judging from the headline “”Beat a path to its door, wherever you live”, we’re pretty sure that his dreams have come true. 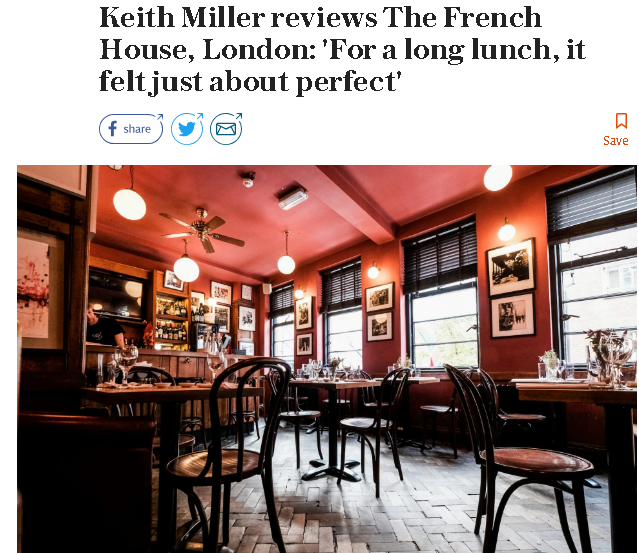 Keith Miller for The Telegraph confirmed the opinions of the critics before him who’d also beaten a path to The French House to try Neil Borthwick’s “robustly self-assured” cooking. It’s a well-loved site packed with “social and gastronomic history”, upstairs from a Francophile pub that was once home to Fergus and Margot Henderson, and also Polpetto. Borthwick’s cooking pays homage to previous chefs with his “Anchor & Hope-style gastropub classics, many of them – pig’s head terrine, calves’ brains – spliced with a few strands of St John DNA”. 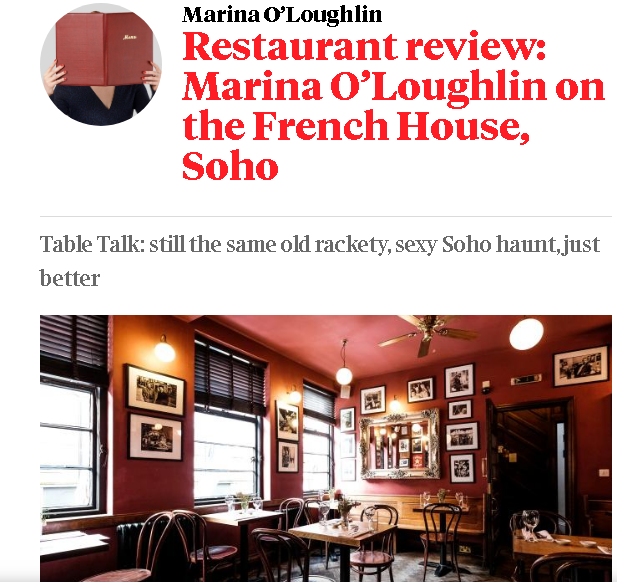 Marina O’Loughlin in The Sunday Times also reviewed The French House, after trying for several months to book. She declared that “Borthwick is a chef who delights in the innate joy of ingredients, of simplicity” after a lunch where she could have eaten anything on the menu. French onion soup was a “muscular brute: meaty, boozy, heavy with bubbling gruyère… completely, messily perfect”; Navarin of lamb was a “stew of dreams” and dessert was “another textbook dish: Paris-Brest”. The room (and some of the customers) seems unchanged in years, “a bit like its neighbour Andrew Edmunds, an echo of that unsanitised Soho”. 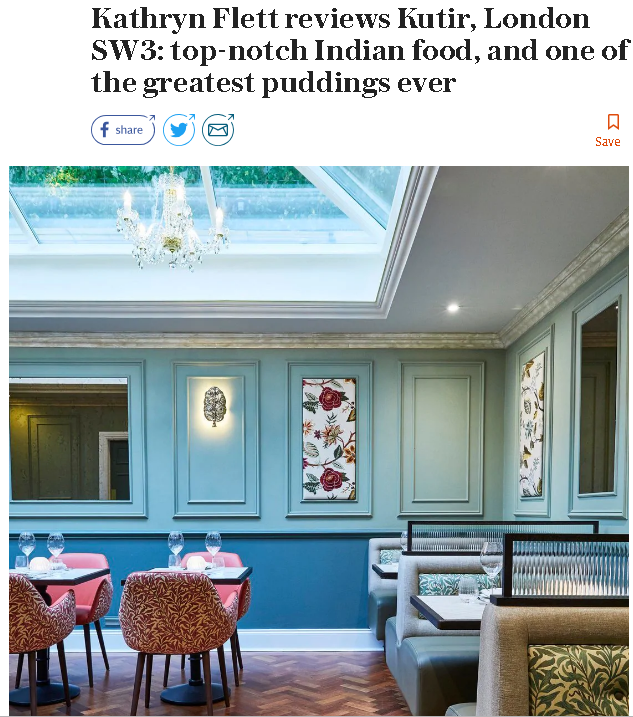 Kathryn Flett in The Telegraph beat the other critics to be the first to review Kutir in Chelsea, Rohit Ghai’s first solo restaurant (after a career in Gymkhana, Jamavar, and Bombay Bustle). Rather than the hut that the name translates as, Kutir is “an elegant town house made over in a palette of jewel colours”… “a mini Rajasthani palace”. 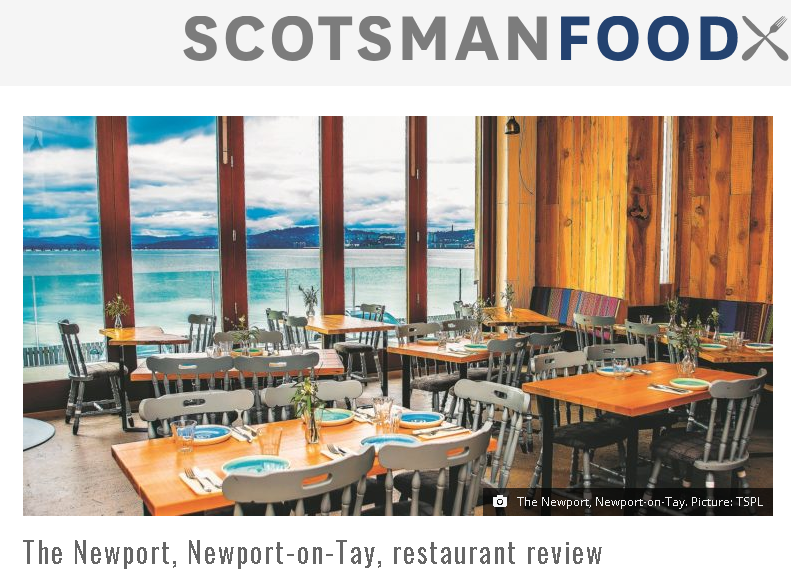 Gaby Soutar for The Scotsman visited TheNewport, from MasterChef: The Professionals winner Jamie Scott. It has a ” a stripped back vibe” and a “direct view across the water” (The Tay). The FT‘s Nicholas Lander wasn’t impressed with Imperial Treasure:”a sense of value is missing”. A rare five-star review from Tom Parker Bowles, writing in The Mail on Sunday. His visit to shipping container restaurant Gambas, on Bristol’s Wapping Wharf, was rewarded with “tip-top tapas”, great seafood (lots of the namesake prawns) and “sensational” cooking. News, Reviews Fay Maschler, Giles Coren, Grace Dent, Jay Rayner, kathryn flett, Marina O'Loughlin, The Evening Standard, The Guardian, The Mail on Sunday, The Observer, The Scotsman, The Sunday Times, The Telegraph, The Times, Tom Parker Bowles, William Sitwell. permalink.